Core values are the guiding principles for a company. Some companies, such as Starbucks, Toms and other businesses that do not utilize a franchising business model, adhere to their core values in every aspect of their brand. Others fail to maintain these same standards. Do not let your company lose sight of what is important. To find out why core values are such an essential part of your company, keep reading below. A business with genuine core values will have a better chance of developing strong business ethics. These principles, which can be anything from family to curiosity, can help determine what direction your company takes in the business world. Establishing an ethical standard for your company will encourage better business practices. The core values of a company speaks to the overall brand identity. This is an additional opportunity to explore your brand’s message to the public. Your customers will remember that your company values quality and innovation far better than a silly commercial, just ask Abbey Carpet. Core values provide an insight into what truly matters to your company, which can speak volumes to clients and customers. Having a clear set of business values can also help draw in new talent. Job seekers today have more access to information about your company than ever before. In order to give your business a boost, you should have the values of business outlined and available for anyone to see. This will allow you to recruit employees who not only do good work but also share the values of your company. By hiring people who share your company’s core values, you are ensuring that your employees will learn and grow with your business. Alongside new talent, defining core values for business can also help to improve the overall company culture. Core values are dynamic yet stable ideas that reflect your company’s commitment to the industry. They can improve your work environment by communicating what is important to your employees and inspire people to take positive action in order to reflect the company’s mission. This is even evidenced in people in the public eye, famous people who failed to identify core values tend to be the ones that eventually fade from the spotlight after making too many mistakes. These principles provide a rallying point for your employees, so that they know the exact ethical standards they are working to meet. Finally, the next important aspect of core principles of business is their ability to educate customers. By establishing a set of business ethics for your company and communicating them to the public, you are giving them a way to identify you among the competition. Similarly to providing you with a brand identity, business standards communicate your company’s unique position in the industry to potential clients and customers. By providing them with information about your core values, you are setting your business apart from its competitors. Identifying core values for business is not a hard task. However, it does require some thought. When trying to identify a business’s core values, you should set aside time to identify areas of importance to your brand identity and company culture. Attempt to identify three or four sentences that succinctly describe your organization. Then, try to narrow the sentences down to a single core word. For example, if you have decided on the sentence “XYC LLC is dedicated to sustainable business practices for long-term, global environmental well-being,” narrow it down to a single core value friendly word, like sustainability. You may even be able to get two core values out of this example – sustainability and social responsibility. Set aside enough time to really put thought into identifying your core values. 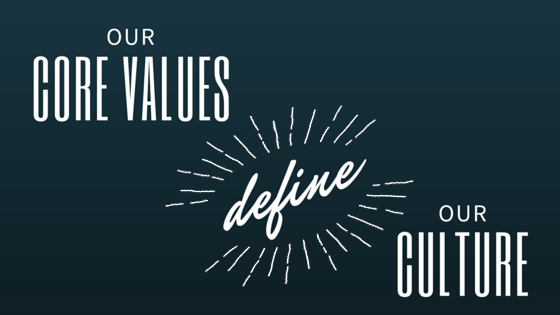 Identifying the core values of your company is an important step to making it better. With a clear set of business principles in mind, you can make better hiring decisions and business decisions. Your company culture and brand identity will immensely improve with the addition of morals for your business. Consider the importance of these guiding principles as you work to improve your business.